There are many reasons older adults should exercise their brains, but at any age, we benefit from attending to our mental capacities. There are many ways to exercise your brain. Many ways are easy to fit into your daily routine. ► Here are nine ways to keep your mind sharp. Eat a balanced diet. Expert opinions vary on what the healthiest dietary may be, yet, they all agree that eating a diet with a wide range of foods is a solid bet. Supplemental vitamins and minerals can help, but the best way to make sure your brain gets the nutrition it needs is to eat plenty of colourful produce, whole grains and enough protein to balance carbohydrates. The brain also needs fatty acids, so make fish a regular part of your meals, as possible. Use all your senses. The brain interprets information from various sensory systems in different areas. When you employ multiple senses in one experience, each of these areas will activate and encourage your brain to do something called sensory integration. When you use more than one sense at a time, you encourage your brain to integrate information, which, in turn, keeps it sharper. One way to do this is to shop at a farmers market and engage with the available produce: smell, touch, taste and look. Another way is to pay attention to your dish out at restaurants. Notice the way the food feels in your mouth and try to identify specific spices or flavours used. Memorize something. Practice daily to reinforce your memory abilities. This can be as simple as learning the name of a new person or reciting a favourite poem. It helps to repeat what you want to remember aloud and use that name whenever you speak to that person; read the poem aloud or to yourself. For other types of memorization, reciting facts and mnemonic devices can be helpful. In addition to supporting cognitive processes, memorization frees up brainpower so you can attend to complex matters. Exercise of any kind is good for the mind as well as the body, but walking in particular offers certain benefits. A 20-to-30-minute walk can boost your mood as well as improve cognitive functions like reaction time and working memory. One study found the impact of your foot on the ground, as you walk, increases blood supply to the brain. Vary your routine. Your brain builds pathways as you create habits and this makes life easier. When you know which route to take to work every day, you don’t have to exert as much effort during that task. Forcing yourself out of these routines is good for your mind, as it encourages your brain to make new connections; this is how neuroplasticity works. Try doing things in a different order in your daily routine, taking a walk in an unfamiliar, but safe, neighbourhood or changing up how you tackle your must-do list at work. You might try using your non-dominant hand or going to a different coffee shop than your regular spot. Other options, such as picking up a musical instrument or a game, such as chess, require both right- and left-brain skills: creativity and problem solving. Learning a new skill can help improve memory and keep your mind agile. Spend just a few minutes every day practicing the skill. Although not all stress is bad stress, an excess of stress is certainly not helpful to your mind. There are many ways to go about reducing stress, from talking a walk to meditating to a simple gratitude practice. Different things work for different people, so try a few relaxation techniques to find the best fit for your daily life. Get enough sleep. During sleep, the body clears accumulated toxins from your brain. This alone means it’s valuable for your mind. You’ll also notice improved cognitive function in your waking hours when you get enough sleep. Being well-rested improves your memory, leads to easier decision-making and helps you focus. The general guideline is that adults need 7-to-9 hours of sleep a night. This varies by person, of course, but you probably know if you’re sleeping enough based on how rested you feel during the day. Keep Learning. 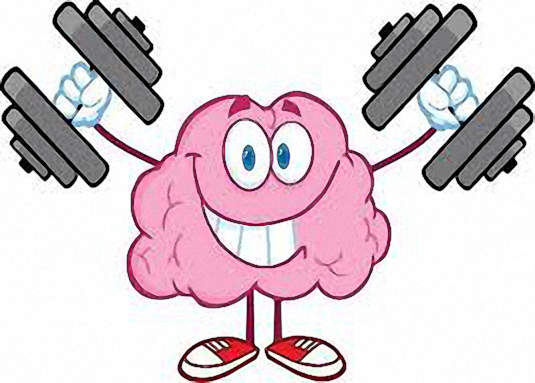 Like a muscle, our minds work best with regular exercise. Fortunately, opportunities for learning outside of school are endless. For instance, you can improve the quality of your screen time by filling the screen with new and interesting information. Streaming documentary services can provide you with endless hours of education and entertainment, not to mention, they’re helpful in conversations at parties. Change what you read, too, and choose nonfiction topics with which you aren’t familiar. Read along with a friend or join a book group to discuss your reading; the verbal processing will help you integrate the information, and you’ll also get to hear other perspectives. If school is available to you, try taking a class about something you always wanted to know more about. Many schools have continuing education programs for exactly this purpose. ► Commit to an active brain. As you can see, many of the ways to keep your mind sharp will benefit not only your brain, but also your body and your mood. Although some ways involve a bigger commitment than do others, there’s no reason not to integrate at least one or two of these practices into your day. Hilary Thompson is an active freelance writer, on the environment and business. She is a mother of two. She runs on coffee and fumes.